*This recipe is a southern version with a Caribbean twist! You can make these puffs few days before, save them at room temperature, and just warm them in the oven at 325 degrees until warm and crisp. Yummy! *For a holiday flavor you can add a teaspoon of cinnamon or anise seeds to the mix. I add both, why not……. In a bowl mix together cheese, flour, pepper, nutmeg, and salt until combined well. Beat whites in another bowl with an electric mixer until they just hold stiff peaks. Fold into sweet potatoes. Mix potatoes and egg whites mix with rest of ingredients gently but thoroughly. Pour canola oil into a fryer and heat until very hot. Grab mix with a big stirring spoon about 8 teaspoons of batter and drop into hot oil 1 spoon at a time. Fry, turning occasionally, until balls of batter are puffed, crisp, and golden, about 2 minutes. Transfer with a slotted spoon to paper towels to drain briefly. Make 3 more batches in same manner, returning oil to 360°F between batches. Serve hot. *Thanksgiving will never be the same without this addition! Preheat oven over 375 degrees. For caramel mix sugar and water and place it in a microwave friendly dish. Cook for 9 minutes, mix, and pour into flan pan. Mix rest of ingredients with your favorite electric mixer until well mixed. Pour over caramel pan. Place pan on top of a bigger pan full of water half way. Cook for 1 hour, check with a knife and cook until done. Let it cool, use a knife to loose sides and turn into a serving pan. Place it in the refrigerator until time to serve. * This is one of my best recipes because after stuffing yourself on thanksgiving you need the added coffee to keep you going. Yummy and practical! FYI; artichoke is a good source of folate, dietary fiber, and vitamins C and K. Artichokes are also packed with antioxidants; they’re number 7 on the USDA’s top 20 antioxidant-rich foods list. 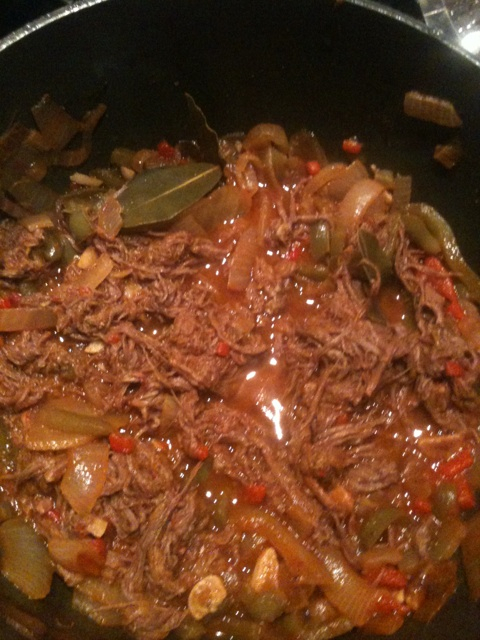 This dish is called Ropa Vieja in spanish and is very popular in Caribbean Cuisine. Coqui! Marinate steak for 30 minute with all ingredients but salt. Season with salt and cook in any hot grill or pan for 3 minutes per each inch thick, per side for medium rare. Let it sit for 5 minutes and serve. *If you love balsamic vinegar on you steak!